There’s no doubt about it, millennials are the internet generation. And not only that, they also love to travel. Is it any wonder that many are combining the two and starting a travel blog? And did you know that you can make money from travel blogging? Matthew Karsten is making six figures from his travel blog, The Expert Vagabond. And that’s not even mentioning perks like free flights, meals, and accommodation. Now you might have heard that travel blogging is a saturated niche and difficult to make an impact in. That’s partly true, there are thousands of travel blogs out there. What you need is a way to stand out from the crowd. One way Matthew Kepnes, Nomadic Matt, recommends is to approach travel writing as a service. Too many travel blogs read like personal diaries. Readers want to imagine themselves where you are, so talk directly to them using the word ‘you’. 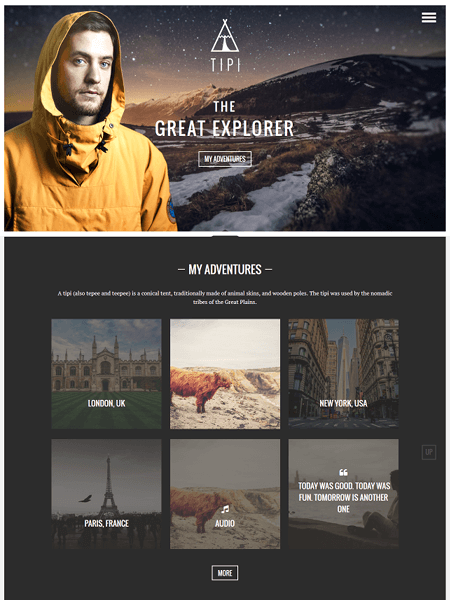 The next thing you’ll need is the perfect WordPress theme for your travel blog to showcase your amazing photos so you can show off your adventures to your family, friends, and fans. This list contains twenty of the best WordPress themes for travel blogs. Whether you’re a digital nomad by profession or simply someone who wants to record their latest getaway from corporate life, these themes have you covered. 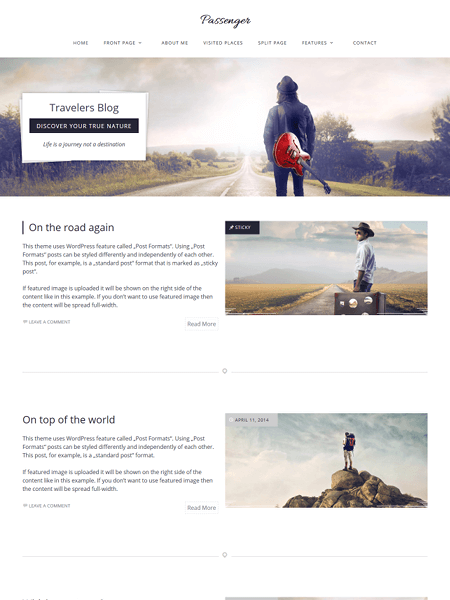 The Traveler is a beautiful and modern theme, designed specifically for the travel blogger. The elegant, grid-based layout puts the focus on your featured images. The different post types allow you to choose the best way to display your photos and articles. 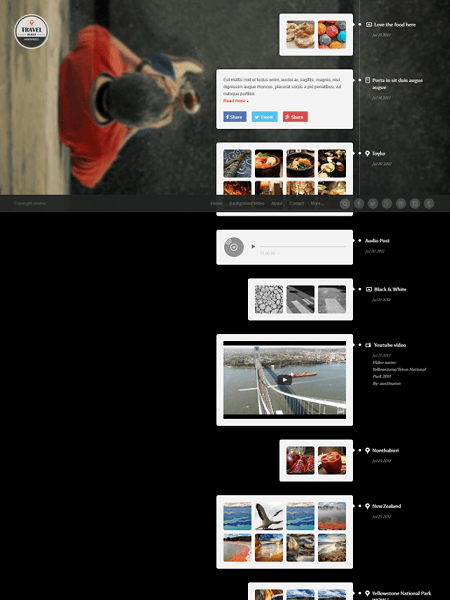 This theme is perfect for image-heavy blogs. The Traveler comes with endless customization options including multiple layouts to choose from and the ability to change the appearance of almost any element of the theme. Using the MeridianStyler you can personalize your blog’s colors, typography, background, and more to get the look that’s right for you. 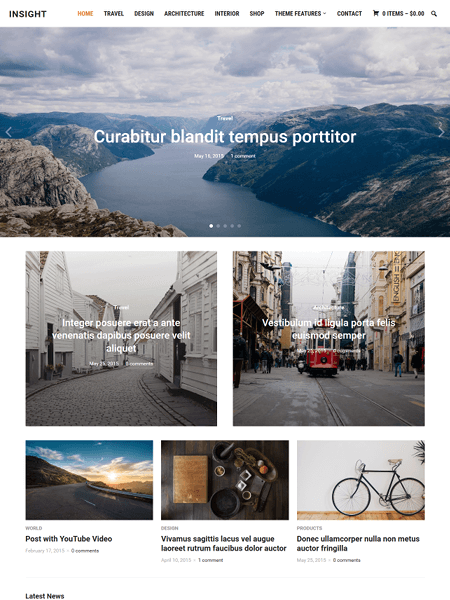 Penamoo is a beautiful and simple theme designed for travel blogging. The high impact full-width slider header on your homepage brings the focus immediately onto your photos. With multiple layout options to choose from, it’s a breeze to get Penamoo looking exactly the way you want it to. There are several post types, including gallery post so that your images are given every chance to shine. A real standout of this theme is the Instagram gallery. The tiled layout is absolutely stunning and is sure to attract more social shares and followers. 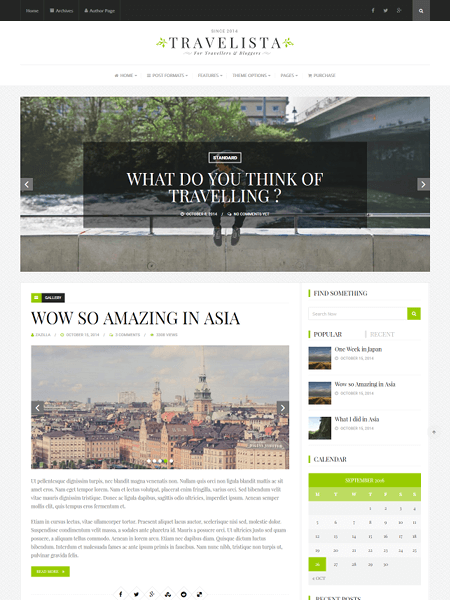 My Blog is a powerful WordPress magazine theme that can easily be adapted to create the perfect travel blog. It is highly customizable with tons of layout, color, and typography options, so you can change the appearance of your blog to your satisfaction. My Blog has several custom post types including gallery and video post options to showcase your travel photos and videos to perfection. It also includes featured posts and a slider, so you can highlight your best content for your visitors. 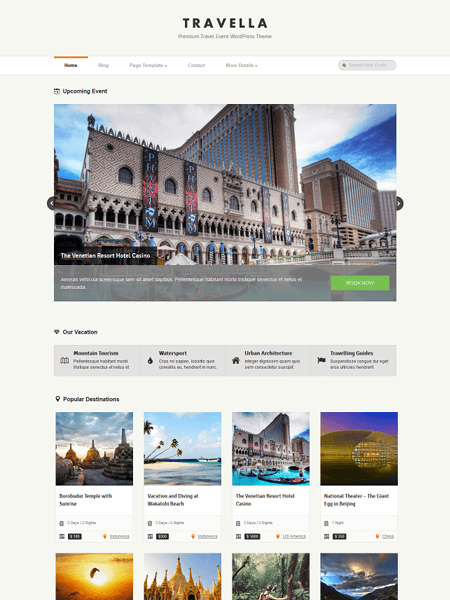 WPVoyager is a powerful theme, perfect for the travel blogger. 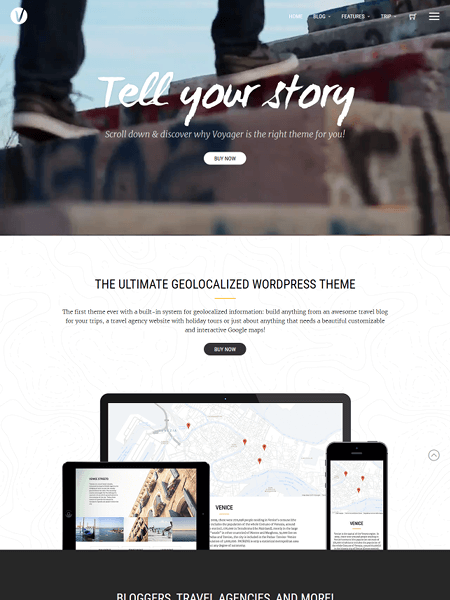 This theme gives you many different layouts to choose from and parallax options for your header to give your site a modern look. WPVoyager also integrates with Google Maps so you can display location information in your posts. Bloggers will appreciate the multiple post types and options including the ability to create a series of posts, perfect for multiple entries in the same location. This theme is great for sharing your trip with loved ones back at home. The location option lets them see exactly where you are in the world, and experience your journey along with you. Voyager is a powerful theme with plenty of visual impact. With a full-width header that’s capable of supporting video, you’ll be able to create a stunning, unique, and modern site. This theme is highly customizable and comes with a powerful built-in page builder with 16 different building ‘blocks’ available including text, accordion, photo gallery, video, and more. Voyager is perfectly equipped to chart your journey with Google Maps integration. This theme allows you to create an interactive map of your travels for sharing with your friends, family, and fans. 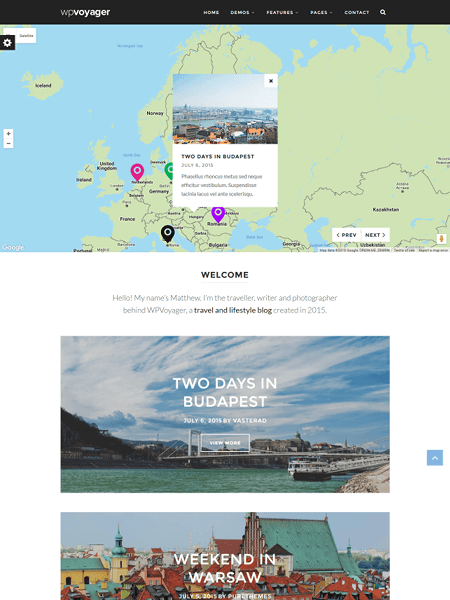 Travelista is a beautiful and simple WordPress theme for travel bloggers. It comes equipped with powerful features that give you incredible amounts of control over the appearance of your site. 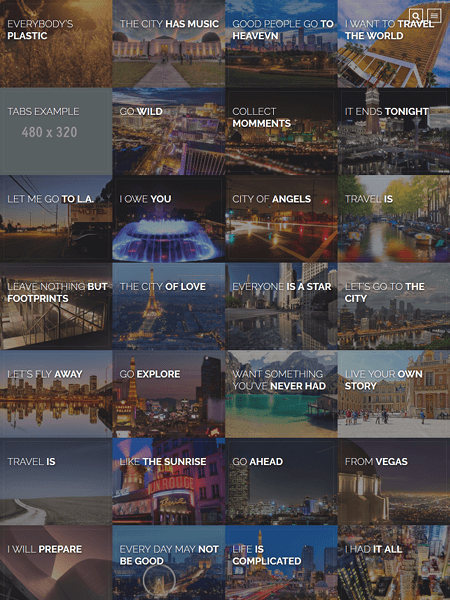 Travelista contains multiple sliders, perfect for highlighting your best content and adding visual interest. There’s also plenty of layout options and color customization options to choose from, so you can personalize your site. This theme also has multiple post types and gives you control over the appearance of each post type. You can customize each one individually to your liking! 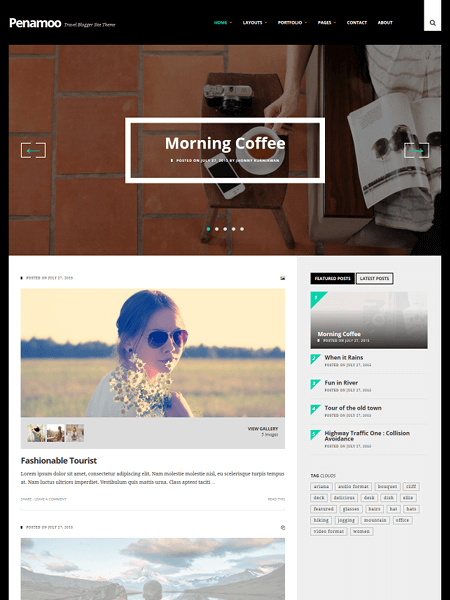 The Essence is a stylish and sophisticated theme for the modern blogger. 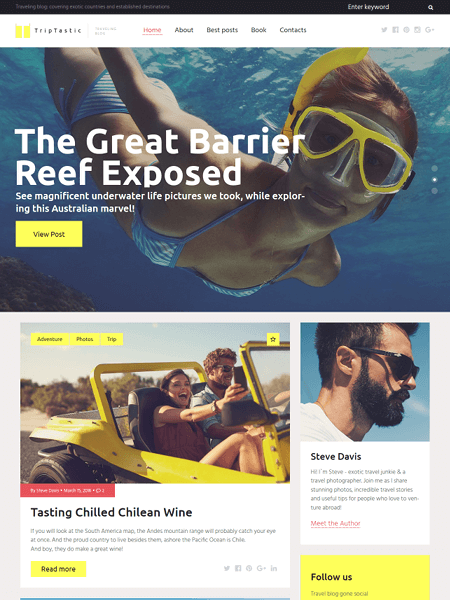 This theme is powerful, feature-rich and very customizable, so you can easily build a travel blog that perfectly suits the adventures you want to share with the world. The Essence has multiple layouts to choose from, a featured slider, and custom widgets. You can also change the appearance of almost any element of the theme with tons of options for colors, typography, background, and more using the MeridianStyler. Insight is a theme with powerful features that make it well-suited to use for a travel blog. As a magazine theme, Insight has visual impact, well suited for displaying stunning travel photos to great effect. This theme is easy to customize to your liking. With a fully widgetized homepage, you have drag and drop functionality. Building the perfect all-important homepage is easy! Insight also comes with multiple options for layout and the ability to personalize the theme colors so you can build your site to your liking. 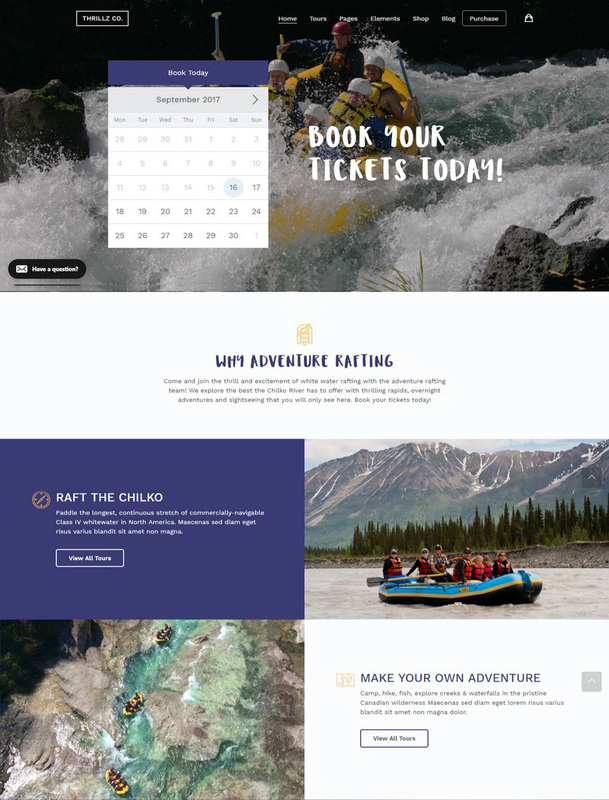 If you’re planning on creating a modern website for your tour company with an effective online booking and scheduling system, Embark is the perfect theme you can get. 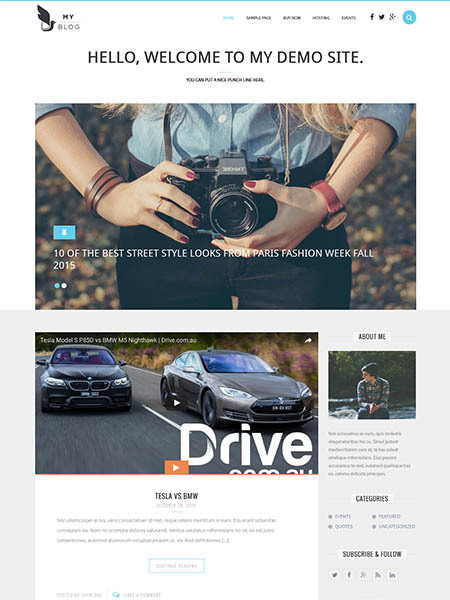 In addition, Embark theme includes 3 pre-made designs and also has a live page builder which will allow you to easily customize the design or even create your own unique layouts for the website. Tipi is a modern looking theme, designed to bring your photos to life. It’s the perfect theme choice for the travel blogger and contains many customization options including layout, post types and image options. Tipi comes with a full screen slider and loads of other options to showcase your images to perfection. This theme is also capable of parallax effects, which adds visual impact and a modern touch to your site. Travelogue is a unique theme with high visual impact. With a full-screen header, capable of still image, slider or video, scrolling reveals a stunning tiled mosaic of all your images with text overlay post titles. Clicking into these images reveals an attractive blog post design with interesting effects and your image as the full-screen header. Travelogue is not as customizable out of the box as most other themes on this list, however it packs some serious visual punch as is. 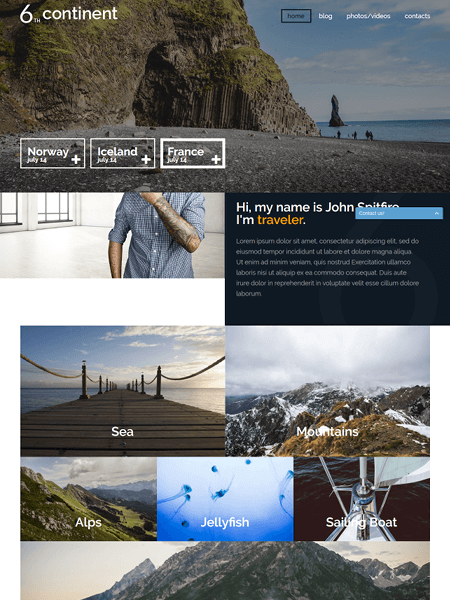 Explorable is a clean and elegant theme perfect for a travel blog. This theme is highly customizable. Using the Theme Customizer you have unlimited color options, multiple font options, and more. A great feature for the travel blogger is the integration with Google Maps. This theme is location-based, so you can add location information to your posts. You can then explore your posts on the map, which is a great way to share your journey with friend and family! 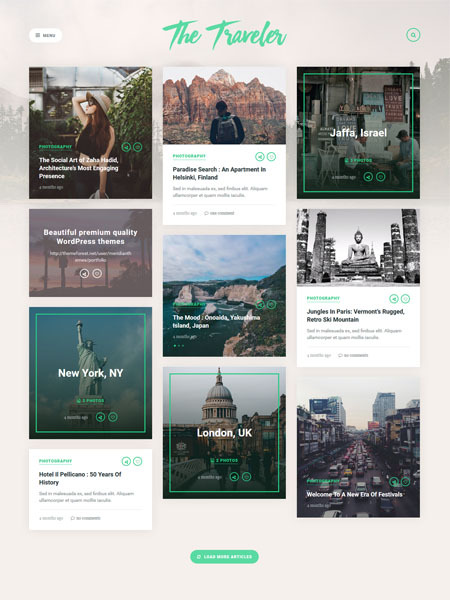 Passenger is a stylish and modern travel blogging theme, perfect for recording your adventures across the globe. 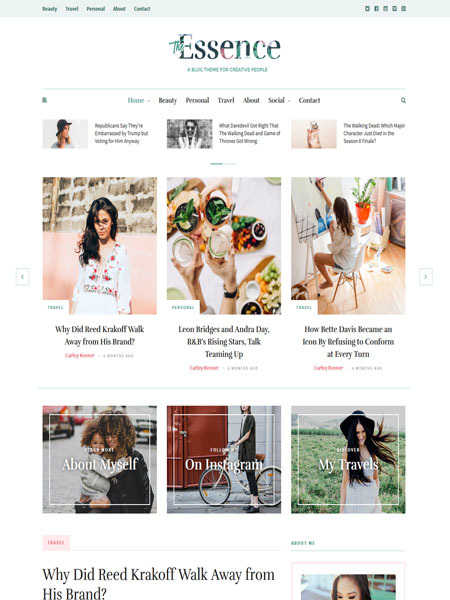 This theme has multiple layout options and comes equipped with the Soliloquy Slider so you can personalize the appearance of your site and draw attention to your best content. The homepage is fully widgetized for easy, drag and drop page building, making it simple to get the look you want. Passenger also has multiple post types which gives you even more options for controlling the appearance of your site. Other theme customization options include colors, typography, and more. Adventure is a stunning theme for adventurers, explorers and travellers. It’s visually rich and perfect for an image-intensive blog. Adventure is highly customizable and comes with many post types and layout options. This theme also comes with full-width featured slider to showcase your best articles. And with Google Maps Widget integration, you’ll be able to involve your family, friends, and fans in your journey by showing them exactly where you are on the map. 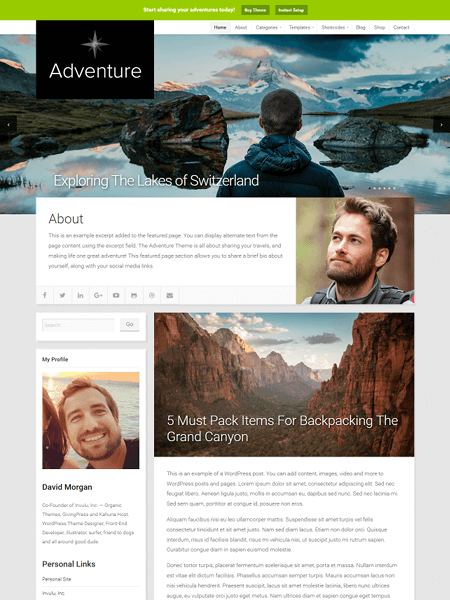 Travella is a feature-rich theme perfect for travel blogging. Designed for travellers and events, Travella has great Google Map integration and custom event type posts. If you’re planning to take part in any events on your travels, such as festivals, concerts, or performances, you’ll find the event posts useful to display all the important information. Who knows? Perhaps one of your followers might be attending the same event! Another great feature of Travella is it displays social proof – the number of likes and comments on each of your posts – helping you earn even more followers, likes, and comments! The 6th Continent is a fresh, modern theme that’s highly customizable so you can get your blog looking the way you want it. 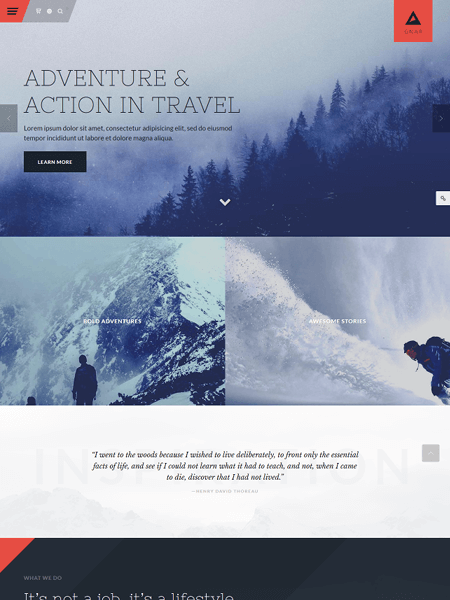 This theme is perfect for travel bloggers and has multiple options for displaying your best travel photos, including sliders, galleries, and header images. This theme contains custom post types and formats which adds visual interest to your blog and it’s also fully customizable, so you can change the appearance of most elements to your liking. Travel is a high impact theme that does things differently. The homepage of Travel is one, full-screen gorgeous photo or video, overlaid by your posts set out in an infinite scrolling timeline. It gives the theme a very modern feel, reminiscent of the Facebook timeline. Posts types include text, images or galleries and each one has a unique visual appearance. Choosing different post types not only gives you added functionality, but also adds to the aesthetic of your site. 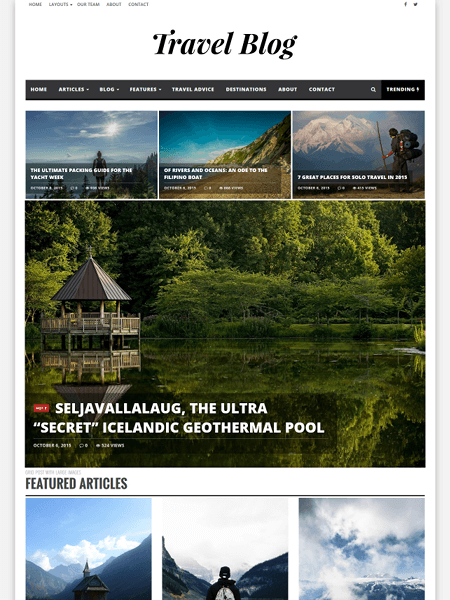 Infra is a powerful magazine theme that works perfectly as a travel blog option. Images are the hero here, and your stunning holiday snaps are showcased to perfection. Infra is a clean and elegantly designed theme and is easy to use out of the box. It is highly customizable with the Orange Themes builder that makes it easy to build pages to your liking with drag and drop functionality. The theme is also compatible with and comes with Visual Composer. 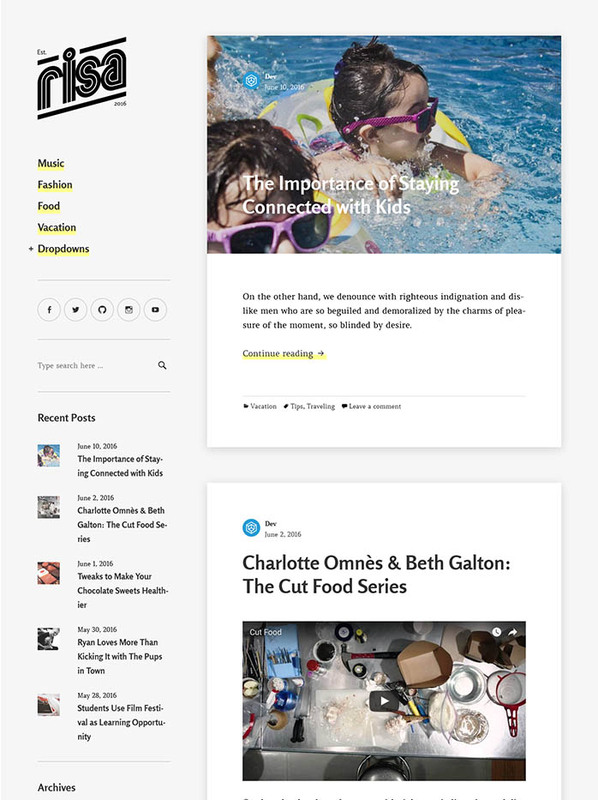 TripTastic is a bright, modern theme that’s perfect for sharing stories about your travels. This theme is bold and bright, with plenty of white space to allow your photos to shine. Highly customizable, the theme comes with many widgets to allow you to build your site the way you want it. Another standout feature that ensures your changes turn out the way you want them to is the WordPress Live Customizer. Using the Live Customizer, what you see is what you get and any changes you make are instantly visible. 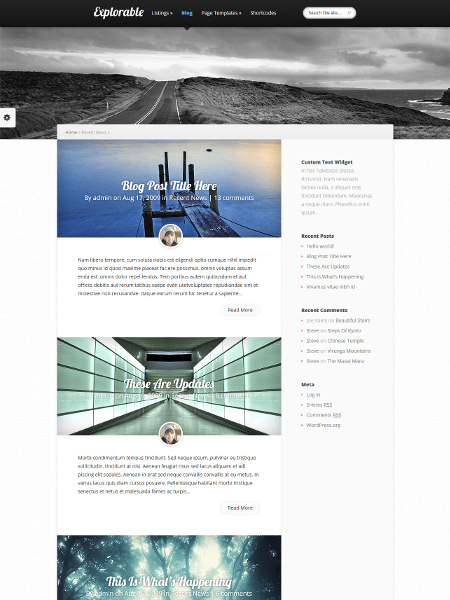 Risa is a lightweight, minimalist theme that can easily be adapted to the needs of travel blogger. This theme is very simple and contains only the essentials – like large featured images to highlight your travel photos. The highlight of this theme is the unique left sidebar. It holds the menu, recent posts and social sharing icons. No matter what page your readers click to, they’ll always have your recent posts in front of them. A theme with serious impact. Gnar is touted as the theme for extremists, risk-takers and thrill-seeker. It’s perfect for those travel bloggers whose exploits are on the adventurous side. With epic standout pages and header, Gnar catches the attention of your audience from the moment they arrive. The parallax and video background options are a nice touch that bring your site to the cutting edge of modern aesthetic. Gnar is extremely customizable, so you can choose your favorite color schemes and it comes with more than 80 layout options. If you’re not sure how you want to set up your site, you can install the demo version and use it as a jumping off point to create the site that’s perfect for you. Has this list inspired you to travel and start a blog about your adventures? Let us know which theme you’d choose in the comments! I have a WordPress.com Premium site. which of these will function with that? I am not a coder. Need something simple to manage. Would like to have a map feature so I can “pin” our travel locations. None of these themes will work with WordPress.com, they are only available for WordPress.org (self hosted & different from WordPress.com). You can see the difference between the .com & .org here. As for map feature, that can probably be achieved via a plugin.